On March 22, people around the world observe World Water Day. Water revolutionizes the health and future of entire societies, and for that very reason, many nonprofits have committed to bringing clean water solutions to global communities. To celebrate World Water Day, we highlight a few organizations that have taken up the worthy cause as their own. Here are five nonprofits that are moving the needle on the issue, and whose campaigns are shedding light on the need for clean water around the world. Mission: Generosity.org is an organization committed to ending the clean water crisis in developing countries. Generosity.org has completed 813 water projects to date, and they have their eyes set on 1,000 projects as their next milestone. To put that in perspective, their work has helped more than 470,000 people in 20 countries get access to clean water. Mission: Focusing on communities in Central America and the Caribbean, Pure Water for the World provides children and families with the tools and education to develop sustainable water, hygiene, and sanitation solutions. 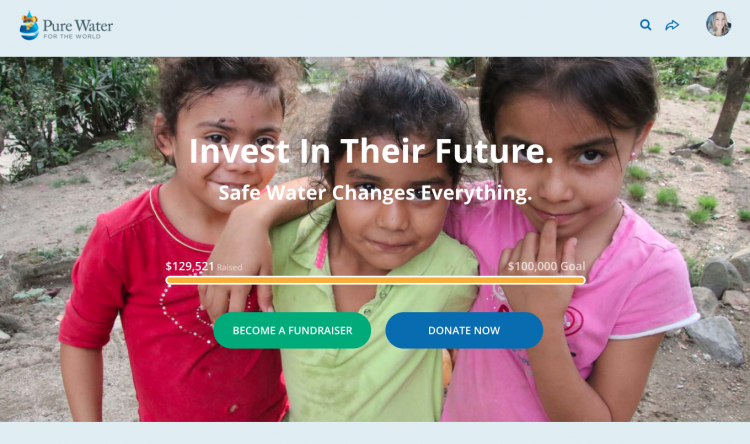 Pure Water for the World’s end-of-year campaign, Safe Water Bright Future, aimed to give more than 4,000 children in Haiti and Honduras access to clean water. They surpassed their $100,000 goal, but the campaign is still active and receiving donations. We love how their campaign page leverages impact blocks to demonstrate how a gift will make a difference for the children they serve. 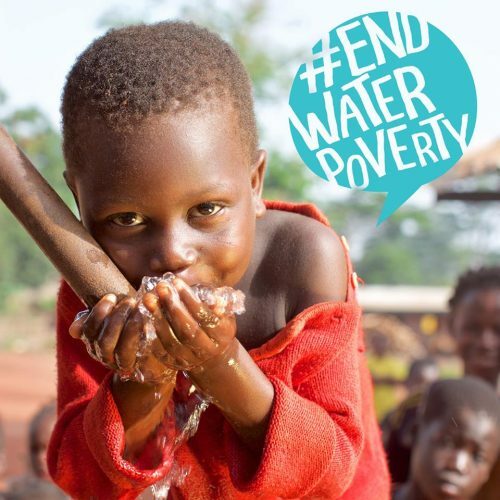 If you’re looking for a water organization to donate to for World Water Day, with Pure Water for the World a $250 donation can bring water to 10 children, $300 for an entire family, and $625 will provide clean water and a bright future for 25 children in need. Mission: Blood:Water is a nonprofit that partners with African grassroots organizations to bring clean water and HIV/AIDS support to one million people in 11 countries. 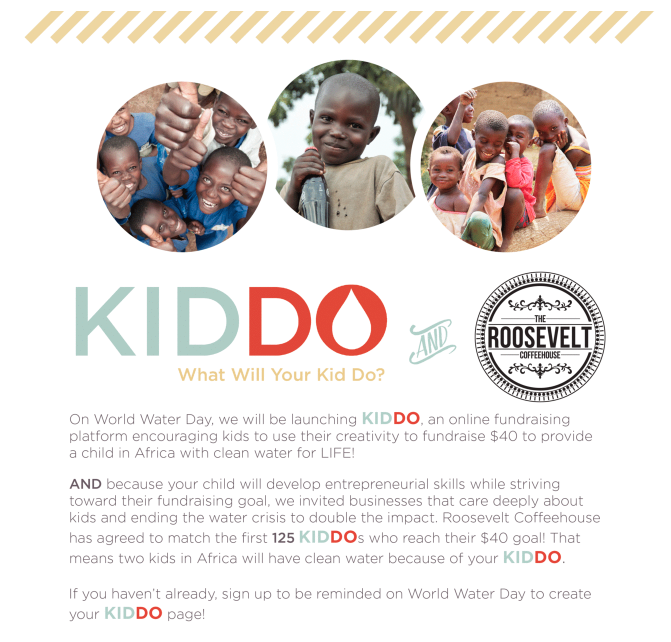 2019 Campaign: To mobilize their supporters, Blood:Water launched an online fundraising platform specifically for a younger KIDDO who wants to make a difference. With an emphasis on creative fundraising methods and an achievable $40 goal, this campaign is looking outside of the normal donor base and encouraging a new generation to act with impact in mind. What’s more is that Roosevelt Coffeehouse has committed to match the donation of the first 125 KIDDOs to fundraise $40, so each young fundraiser will impact twice as many children in need. For the big kids who want to show their support for a water charity, Blood:Water is selling a “Water Box” filled with treats from social good brands like Cause Roast and The Created Co. Each box sold provides clean water for two people for a month. Mission: Water for Good works with communities in central Africa to establish sanitation best practices, improve agriculture, and empower people to create sustainable clean water access. 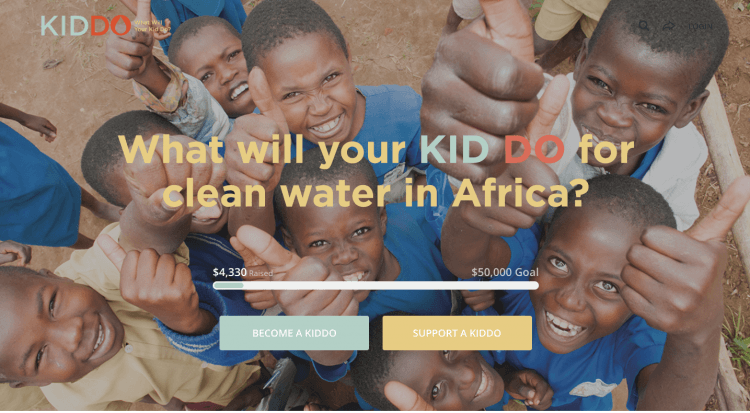 2019 Campaign: Water for Good is raising awareness about their efforts in the Central African Republic to empower underserved communities with clean water access. 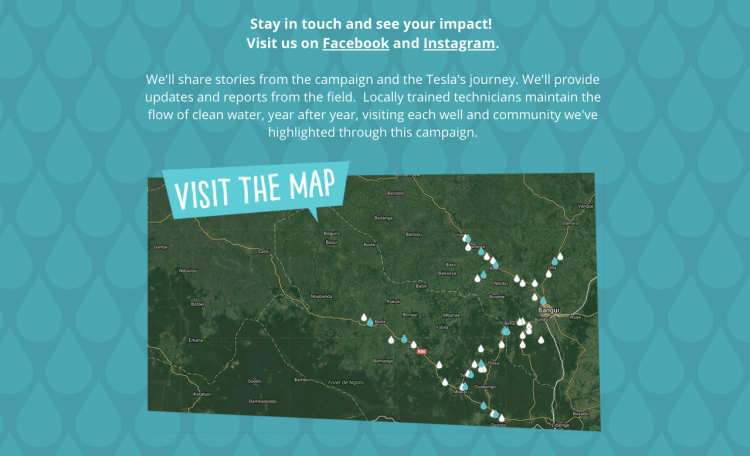 This year, Water for Good teamed up with Pacific Union College to launch the 5,000 drops campaign to raise awareness and funds by traveling the U.S. in a custom-wrapped Tesla. The car’s exterior is covered with 5,000 gray drops, each of which contains GPS coordinates and represents a family of four in the Central African Republic that Water for Good will provide with clean, reliable water. One $25 donation turns a gray drop blue and by the end of the tour, if all 5,000 gray drops have been “turned blue” through donations, Water for Good will be able to provide clean water to 20,000 people in need. Learn more about the 5,000 drops campaign or follow the journey on Instagram. Mission: Hope of Life International is a faith-based organization dedicated to effectively serving vulnerable children and families in Guatemala. Using storytelling best practices, Hope of Life International uses video and images to supplement their beneficiary stories that outline how their efforts and the support of their community can prevent deaths due to diseases like typhoid and cholera. They drive home the importance of each donation with the message that it only takes one dollar to provide a child with clean water for a year. If you need ideas on how to celebrate World Water Day, this is a good place to start. These organizations and their campaigns are pushing the envelope to bring safe water to communities everywhere. Join in the global celebration today. This post was originally published in March 2015 and has been updated with recent examples.